A1. All praise is due to Allah, and I invoke peace and blessings upon our Prophet Muhammad, and upon all of his Companions. 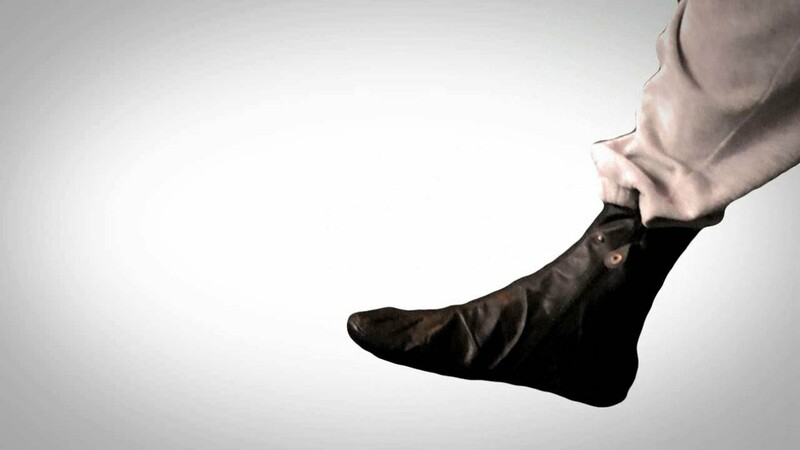 The meaning of the khuff is that which is worn upon the foot being made of leather and its likes. The meaning of Jawaarab is that which is worn on the foot being made of cotton and its likes, and it is what is referred to commonly as shurraab (socks, stockings). A2. The wiping is a sunnah which has come to us from the Messenger ﷺ, and it is better for the one wearing them to wipe over them, rather than taking them off to wash his feet. Reciting it as wa Arjulakum with a fatha on the laam, hence linking it in meaning to wa wujoohakum (and your faces), i.e. wash the feet. Reciting it as wa Arjulikum with a kasra on the laam, hence linking it in meaning to bi ruoosikum (your heads), i.e. wipe the feet. And that which explains when one should wipe the feet and when one should wash them is the sunnah, for the Messenger ﷺ used to wash his feet when they were uncovered, and wipe over them when they were covered by khuffs. As for its legislation in the sunnah, the sunnah is mutawaatir from the Messenger of Allah ﷺ in this sunnah. So this is the evidence from the Book of Allah, and the Sunnah of His Messenger ﷺ.
Q3. What are the authentic, established conditions for wiping over the socks and what are their evidences? The second: that the khuffs or jawaarabs be pure and clean. If they have filth on them then it is not permissible to wipe over them. And the evidence for this is that the Messenger of Allah ﷺ prayed with his Companions one day in shoes, and during the prayer he removed them. Then afterwards he informed his Companions that this was because Jibraaeel had informed him that they had filth or dirt on them. And this indicates that the prayer is not acceptable when there is something in it which is impure, and because when the wiper wipes over the filth it sullies him also, and then he is also not in a state of purity. So the condition is set that the wiping is only for minor impurity, not for the major impurity due to this hadeeth.  the Messenger ﷺ set a limit of one day and night for the resident, and three days and nights for the traveler, meaning for wiping over the khuffs. And this period starts the first time one wipes over the socks, and it finished 24 hours after for the resident and 72 hours after for the traveler. So if we were to assume that one purified himself for fajr on Wednesday at 5am, and he remained in this state till the Ishaa prayer, then he slept and woke for fajr at 5am on Thursday then he has to make wudu with washing his feet as the period has expired. But were he to make wudu before 5am then his wiping is valid and he can pray fajr with this wiping. And he can keep praying as much as he wishes afterwards as well with that same wudu, for the wudu does not become void when the period of wiping ends according to the strongest opinion of the scholars. And this is because the Messenger ﷺ did not set a time period for the state of purity, but he set a time period for the wiping only. So when the period for wiping has finished then there is no wiping after this, but if he was in a state of purity when the period expired, then his state of purity remains. This is because this state of purity has been established according to the dictates of the shareeah, so then it cannot be removed except by an evidence from the shareeah, and there is no evidence for the state of wudu ending as the time period for the wiping ends. And because the basic principle is that everything endures according to what it is upon until its termination is made clear. So these are the conditions that are set for wiping over the khuffs. And there are other conditions that some scholars have mentioned but some of these are problematic. so there is no difference in this between a thin, thick, torn or complete sock. Q5. A Person makes tayammum, then he wears the khuffs, then he finds water, is it permissible for him to wipe over the socks knowing that he was in a state of purity when he wore them? And the purity of tayammum has no connection to the feet, rather it is only concerned with the hands and face. So building upon this, if a person does not have water with him, or he is sick and unable to use water for wudu, then he can wear the khuffs even without being in a state of purity, and he can wear them for an unlimited time (making tayammum) until he finds water or is cured from his illness, because the feet are not connected to the tayammum. Q6. Is the intention obligatory, meaning that when a person intends to wear socks or shoes should he have the intention that he will wipe over them, and likewise should he have the intention that he is going to wipe over them as a resident or a traveler, or is the intention no obligatory? A6. The intention is not obligatory because the ruling of wiping is concerned only when the need arises and therefore it is not requiring an intention. Just like if a person were to wear a garment, it is not a condition that he has to have the intention that this garment covers his awrah when he prays. So it is not a condition that he has to have the intention that he will wipe over the socks when he wears them. Likewise he does not have to have an intention as to how long he intends to wipe for, rather if he is traveling then he has a period of three days whether he had the intention for this or not, and if he is resident he has a period of one day whether he had the intention for this or not. Q7. What is the journey in which the wiping period of three days and nights becomes permissible? A7. The journey in which it becomes permissible to shorten ones prayer, is the journey in which it becomes permissible to wipe over the socks for three days and nights, this is because in the hadeeth of Safwaan bin Asaal which we have mentioned he says, when we were on a journey, so for as long as a person is on a journey in which he shortens his prayer he can wipe over his socks for the period of three days. Q8. When the traveler comes to the end of his journey, or a resident starts a journey and he has already started wiping over his socks, how does he calculate the length of his wiping? A8. When a resident wipes over his socks and then starts a journey, then he should complete the wiping of a traveler (i.e. 3 days and nights) according to the strongest opinion. And if he was traveling and then completes his journey, then he should complete the wiping of a resident. Some of the People of Knowledge have mentioned that if one were to wipe as a resident then start a journey he should complete the period of wiping as if he were a resident, but the strongest opinion is what we have first mentioned. This is because this person has some time remaining in the period of his wiping before he started on a journey, then he started traveling so it is true to say that he is a traveler and therefore from those that can wipe over there socks for three days. Q9.A person is doubtful as to when he started wiping over his socks, what should he do? A9. In this state the answer is based upon what is certain, so if he is doubtful if he started wiping for Dhuhur or Asr prayers, then he should make his starting period Asr because the basic principle is the absence of wiping. And the evidence for this is the rule that the principle remains upon what it is and that the basic principle in this case is the absence of wiping. And that a man complained to the Messenger ﷺ that he thought that he had passed wind in his prayer, so he told him not to leave the prayer until he heard a noise or smelt something. Q10. A person wipes over his socks after the period of wiping has expired and prays, what is the ruling of his prayer? A10. If he wipes after the period has expired, whether he is traveling or resident, then his prayer with this purification is invalid because the wudu is invalid due to the period of wiping having expired. So it is obligatory upon him to make a new and complete wudu, washing his feet, and to repeat his prayers that he prayed with that invalid wudu in which he wiped over his socks after the period had expired. Q11. If a person removed his socks and he was in a state of wudu, then he put them on again before his wudu broke is it permissible to wipe over them? A11. If he removes his socks and then puts them back on again and he is in a state of wudu, then if this wudu was his first wudu (i.e. the one in which he washed his feet) and this did not break for the duration he had his socks on, then there is no problem in him putting his socks on and wiping over them again when he makes wudu. But if this wudu was a wudu in which he wiped over his socks then it is not permissible for him to put his socks on and continue wiping over them, because it is necessary for him to wear them when his feet have been purified with water, and in this case the purity is with wiping over the socks, this is what is known from the speech of the People of Knowledge. But if one were to say that if he put his socks on again while he was still in a state of purity, even if it were the purity of wiping over the socks, then he could continue wiping over them as long as the period of wiping lasted then this is a strong opinion. But I do not know of anyone who held this opinion, and the thing which prevents me from holding this opinion is that I have not come across anyone from the People of Knowledge who holds this opinion, so if one of the People of Knowledge were to have this opinion then this would be the correct one according to me. This is because the purity gained from wiping is a complete state of purity, so it is desirable to say that if he can wipe over his socks after putting them on after having washed his feet, then he can wipe over them after the purification of wiping over them. But I have not seen anyone who holds this opinion. Q.11	So therefore we do not say that removing the socks is from the things which invalidate the wiping? A.11 Therefore removing the socks (in this second case) does not invalidate his state of purity but it invalidates his wiping, so if were to put them on again another time and broke his wudu then it is necessary for him to remove his socks and wash his feet when he makes wudu. The important point is that it is necessary for him to have put the socks on when he has made a wudu in which he has washed his feet (in order to wipe over them later on) as far as we know from the speech of the People of Knowledge. Q12. A person wipes over his shoes in the first instance, then in the second he removes his shoes and wipes over his socks, is this wiping of his correct? Or is it necessary for him to wash the feet? A12. There is a difference of opinion over this. So from the People of Knowledge are those that opine that if one were to wipe over one of the two khuffs, be it the upper or the lower then the ruling remains with that and the wiping does not move to the second. And from them are those that opine that it is permissible for the wiping to move to the other for as long as the period of wiping remains. So for example, if one were to wipe over the shoes, then he removed them and wished to make wudu, then he can wipe over his socks. This is the strongest opinion. Likewise if he were to wipe over his socks, and then put on another pair, or put on a pair of shoes, then there is no problem in his wiping over the upper layer for as long as the period of wiping remains. But the period is calculated from the point of the first wiping, not the second. Q13. Many people ask as to how the wiping should be done and the place of wiping? A13. The way of performing the wiping is to pass the hand over the feet from the extremity of the toes to the start of the shin only. Meaning that the part of the khuff that is wiped is the upper part only. And the wiping is done by passing both hands over both feet simultaneously i.e. the right hand wipes over the right foot and the left hand over the left foot at the same time, as one would wipe the ears. Because this is what is clear and obvious in the sunnah due to the saying of Mughira bin Shuba (in his hadeeth), and he wiped over them, and he did not say he ﷺ started with the right or left, rather the clear and literal meaning is what we have explained. Yes, if one of the hands cannot be used then you start with wiping the right foot then the left. Q14. We see people wiping over the upper and lower parts of the khuffs, so what is the ruling of this wiping and what is the ruling of their prayers? And this indicates that only the upper part of the khuff is legislated to be wiped. Q15. What is the stance on the saying of ibn Abbaas: the Messenger did not wipe after (the revelation) of Surah Maaidah and that what is related from Alee preceded this revelation? A15. I do not know if this narration is authentic or not. And I have mentioned before this that Alee bin Abee Taalib is from those that narrated the hadeeth of wiping from the Messenger of Allah ﷺ and he narrated it after his death, and he explained that the Messenger set its time limits, and this indicates that this ruling is established to exist after the death of the Messenger of Allah ﷺ according to him, and it is not possible to abrogate anything after the death of the Messenger. Q16. Are the rulings for wiping the same for women as for men? Or is there a difference? A16. There is no distinction between man and woman in this. And it is desired that you learn a basic rule, and that is that in principle that whatsoever is established with regards to the men is also established with regards to the women, and whatsoever is established with regards to the women is also established with regards to men unless there is an evidence which indicates otherwise. Q17. What is the ruling of removing the sock, or part of it to examine ones feet or to remove a small stone for example? A17. If he puts his hands in his socks (without removing them) then there is no problem in this. But if he removes them then he should look, if he removes only a small portion than this is alright, but if he removes the majority of the sock then wiping over them in the future becomes invalid [in the case where this is not the first wudu]. Q18. It has become common amongst the common folk that they wipe over their socks for the five daily prayers only, then after this they put them on another time (i.e. after washing their feet). A18. Yes this has become common amongst the generality of the people who think that wiping for one day and night means that you wipe only for the five daily prayers, and this is not correct. Rather the limitation of one day and night means that he can wipe for one day or night whether it is for five prayers or more. For, as has preceded, the beginning of the period of wiping starts with the first wiping. So it is possible that the person pray ten (obligatory) prayers or even more. For if he were to make wudu for fajr on Tuesday, and then out his khuffs on, and his state of purity (i.e. he did not make wudu) lasted until he slept Tuesday night, then he wakes up Wednesday morning for fajr and wipes over his feet for the first time then he can continue wiping till the fajr of Thursday morning. So in this case he has prayed the fajr, dhuhur, asr, maghrib, and ishaa of Tuesday in his khuffs, and none of these are counted in the period of wiping because they occurred before he wiped over his socks. Then he prayed the fajr, dhuhur, asr, mahgrib and ishaa of Wednesday with wiping. It is even possible that he pray the prayers of Thursday with this same wiping. So for example say he wiped over his socks 5am Wednesday morning for fajr, then he woke up for fajr Thursday morning and made wudu at 4:45am, he can wipe over his socks again in this case. Then if he were to remain in his state of purity until Ishaa of Thursday, then he can pray the five prayers of Thursday with that same wiping. Therefore in this example he has prayed fifteen prayers (without removing his khuffs). Q19. If a person were to make wudu and wipe over his khuffs, then the period of wiping expires and he removes his socks before Asr prayer for example. Can he pray Asr prayer and is his prayer correct, or does his wudu break with removing the socks? A19. The strongest opinion from the sayings of the People of Knowledge, which was chosen by Shaykh al-Islaam ibn Taymiyyah and a group of scholars from the People of Knowledge is that the wudu does not break with the removal of the khuffs. So if he were to remove his khuffs and he is in a state of purity in which he had wiped over his socks then his wudu does not break, this is because he is in a complete state of purity as required by the dictates of the Shareeah, and it is not possible to break this state of purity except with an evidence from the Shareeah. And there is no evidence which states that removing the khuffs or socks that have been wiped over breaks the wudu, so due to this the wudu remains, but if he were to put the socks on again intending to wipe over the socks in the future then this is not allowed as far as I know from the words of the People of Knowledge. Q20. Is it permissible to wipe over the turbans and what are the limits of this and what is the definition of a turban? A20. Wiping over the turbans is from those actions that have been reported in the Sunnah of the Messenger ﷺ and it is permissible to wipe over them. So one wipes over the turban or the majority of it, and it is also the sunnah to wipe over the bare regions of the head like the forehead and the back of the head and the ears. Q21. Does the white cotton skullcap, and **** of the woman enter within the definition of the turban? A21. As for the white cotton skullcap then this does not enter the definition of the turban at all. As for what is worn in the days of winter which covers the head and the ears and that which is below that coiled around the neck then this is like the turban due to the difficulty in removing it so one can wipe over it. madhab of Imaam Ahmad as long as the headscarfs hang below their necks, this because it occurs from some of the women of the Sahaabah may Allah be pleased with them. Q22. The fez is above the head and tends to be attached to the neck, so is this wiped over? A22. Clearly when it is not difficult to remove the fez then it is not permissible to wipe over it because in some aspects it resembles the skullcap, and the principle is the obligation of wiping over the head until it is made clear to man that this is from those that are permissible to wipe over. Q23. What is the ruling of wiping over the bandage, and what things are included in its meaning, and what is the evidence of its legislation from the Book and Sunnah? A23. Firstly it is necessary that we understand what a bandage/splint is. A bandage/splint in its origin is that which is used to set broken bones. In the convention of the Legal Jurists it is that which is placed over a part of the body which needs to be washed while purifying oneself due to a necessity like the preventative measure over a break, or the plaster/bandage which is placed over a limb or over a pain in the back or the likes. Wiping over this compensates for washing. So if we were to assume that there was a bandage over the forearm of the one making wudu due to a necessity, then he can wipe over it rather than washing (the area covered by the bandage). And this purification would be complete, meaning that were he to remove this bandage or splint then his state of purity remains and does not break. This because the purification is complete in the eyes of the Shareeah and there is no evidence that states that removing the bandage breaks the wudu or the state of purity. There are some weak ahaadeeth pertaining to this which some of the People of Knowledge used saying that all of them taken together raise them to a level that can be considered a proof. And from the People of Knowledge are those that say that they cannot be depended upon due to their weakness, and then they differ amongst themselves – some say that the person leave washing the place of the bandage because he is incapable of washing it, and others say that he should perform tayammum and not wipe over it. Firstly: That it be uncovered and washing it will not harm him, then in this state washing the area is obligatory. Secondly: That it be uncovered and washing it will harm him but wiping over it will not. So in this case wiping over it is obligatory rather than washing. Thirdly: That it be uncovered and both washing it and wiping over it will harm him. Then he performs tayammum. Fourthly: That it be covered by a plaster or the likes due to a need. So in this state he wipes over this covering and he does not have to wash the area covered. Q24. Are there conditions for wiping over the bandage? Meaning if the need for it was no longer present? A24. The bandage is not wiped over except when there is a need. And a need is not merely for a wound or pain, rather anything which needs this plaster or bandage, for example, to strengthen it falls within the need. Q25. Is a wrapping or muslin included in its meaning? A25. Yes it is. Also know that wiping over the bandage is not like wiping over the socks in that there is a specific time period, rather he can wipe over it for as long as the need remains, and likewise he can wipe over it from both the major and minor impurity not as in the case with the khuffs as has preceded. So when ghusl is obligatory upon him, he wipes over it (the bandage) as he wipes over it when making wudu. Q26. How should he wipe over the bandage? Does he wipe over all of it or a part of it? A26. Yes he should wipe over all of it because the principle is that the replacement has the same ruling as the replaced as long as nothing in the Sunnah occurs which establishes other than this. So in this case the wiping replaces the washing, so just as it was necessary to wash the whole limb, then likewise it is necessary to wipe over the whole bandage. As for wiping over the socks then this is a concession and the Sunnah states that only a part of it be wiped (i.e. the top only). Previous articleHow Do I Pray When I am Ill?